Maybe there’s a market for a new bumper sticker in the campus bookstore: “Hollins Women Who Are Going Places Start in the Yard.” Students might not yet understand the message, but it should sell like hotcakes during reunion week. For many Hollins women, leaving school and getting a yard to call their own is the beginning of a lifelong interest that blooms into volunteer service and, for some, a professional focus. The commonwealth of Virginia has particularly benefited from the hard work, artistry, and vision of alumnae gardeners. The image of a garden club as ladies in hats lunching or having tea could not be more outdated in Virginia. The Garden Club of Virginia (GCV) is a powerful organization with influence in conservation, environmental, and horticultural discussions and decisions across the state. Its mission, “to celebrate the beauty of the land, to conserve the gifts of nature and to challenge the future generations to build on this heritage,” is a mandate to its forty-seven member clubs across the state. Since 1929, GCV has restored more than fifty public gardens, including the Beale Memorial Garden on the Hollins campus (see “The Re-greening of the Garden”). GCV membership and leadership rosters are filled with Hollins women. In fact, GCV meetings often feel like a Hollins reunion. 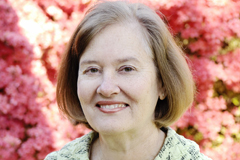 Mary Kimbrough “Kim” Nash ’72 serves as the current GCV president. Although she grew up in Old Towne Alexandria “surrounded by brick,” she inherited a gardening gene from her Lynchburg grandmother. When she and her husband moved to an old farmhouse in Warrenton, she began to work in the yard and became an active member of the Warrenton Garden Club, a GCV club. She served in many GCV leadership roles before taking the reins as president in 2010. Nash oversees six professional staff members and a yearly operating budget of almost $1.5 million. Garden restoration is “very dear to me,” she said, especially the work the GCV has undertaken at Thomas Jefferson’s retreat, Poplar Forest, near Lynchburg. The project has particular meaning for Nash. The property was sold out of the Jefferson family and remained in private hands until 1984. Nash’s aunt and uncle lived there for fifty years. She spent time on the estate as a child and was a bridesmaid when her cousin married there. GCV has already begun its collaboration with the Corporation for Jefferson’s Poplar Forest on the first of the two projects of the restoration’s first phase. Because the gardens no longer exist, and there are no period drawings to guide the way (although Jefferson’s records are providing some clues), the work began with extensive site excavation and lab analysis. The next step was to plant a double row, or allee, of paper mulberry trees, on the west side of the octagonal house. Nash helped toss final shovelfuls of dirt onto the tree plantings in a ceremony last December. The second project will be to restore the ornamental beds and tree groupings at the front of the house. When she was inducted as GCV president, Nash quoted the Hollins motto, Levavi Oculos (from the 121st Psalm: “I will lift up mine eyes unto the hills”), as a call to “be still, examine, and consider.” In GCV, she has found many other reminders of her Hollins days, largely because of the considerable overlap between the Hollins and GCV networks. “I don’t think I could have a flat tire anywhere in Virginia that I wouldn’t know someone to call,” she said, laughing. Something mysterious happened at Hollins in the mid 1970s. Whatever it was, it blossomed in gratifying ways: the current and past two chairwomen of the Garden Club of Virginia Historic Garden Week Tour came from the class of 1975. Chairing the statewide tour, which funds GCV’s restoration projects, calls for extraordinary leadership skills and is a huge time commitment. Each leader must serve as assistant chair for two years before taking control, and planning begins four years out. The pay-off is also huge. Dubbed “America’s Largest Open House,” the weeklong tour attracts some 25,000 visitors from around the world. In 2011, it netted $450,000. 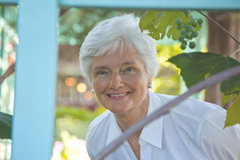 Patricia “Tricia” Totty Sauer ’75, the 2006-08 tour chair, grew up around women who enjoyed gardening. A member of Tuckahoe Garden Club of Westhampton, Sauer sees her service with GCV as a “good way to give back to the commonwealth.” Her leadership proved to be a good way to give back to Hollins, too. The tours she led helped fund the restoration of the Beale Garden. Sauer’s own garden has evolved over the years and she continues to simplify by planting masses of hydrangeas. Last year her house and garden were on the Richmond tour, and she is also taking care of a second garden at her cottage on the James River. Because she wants to enjoy more time there and with her grandson (son of Sauer’s daughter, Ashley Sauer Oswalt ’02), she continues what perhaps only she would call a “low-maintenance” effort in her gardens. Martha Ware Stone Bryan ’75, a member of the James River Garden Club in Richmond, chaired the 2009-11 state tour. She modestly defined her role as that of a cheerleader. Seeing different houses and gardens, picking up new ideas, and running into old friends (often from Hollins) were her biggest pleasures. Her 2011 garden tour companions were her mother, Franklin Brockinton Stone ’47, and her sister, Franklin Stone Wenk ’74. 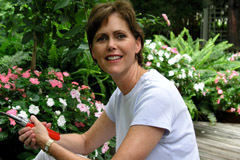 Bryan’s mother-in-law fostered her interest in gardening many years ago, and she joined the garden club to learn more. 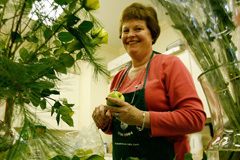 She doesn’t consider herself “a natural flower arranger” but has pushed herself to learn. The club lectures and tips about plant propagation have come in handy in her own flower and herb garden. Bryan said her appreciation for the beauty of the Hollins campus and surrounding mountains deepened her enjoyment of the natural world. And the organizational skills she sharpened at Hollins proved to be invaluable when she served as tour chair. Anne Getty Cross ’75 is leading the tour in 2012 and 2013. She grew up in a family of gardeners in Williamsburg and started with a “one of everything” vegetable garden. She and her husband, Elmo, have planted thousands of daffodil bulbs at their place in Hanover Courthouse and have a fenced vegetable garden at their second home in Matthews. As a member of the Ashland Garden Club, Cross led the local tour before she took on the state tour. Besides coordinating the 191 homes, gardens, and landmarks on this year’s state tour, the chair is also responsible for the massive public relations and marketing efforts. Cross is overseeing a partnership with the Virginia Tourism Office and is for the first time including social media in the marketing mix. In the summer of 2011, Cross and GCV’s professional garden week director, Karen Miller, produced An Insider’s Guide to Producing America’s Largest Open House, a how-to manual for tour chairs across the state. Being involved in leadership positions with the Historic Garden Week Tour isn’t the only way Hollins alumnae have had an impact on Virginia gardens. Gardener and writer Jane Baber White ’62 has altered the landscape, earthly and literary, of her native Lynchburg. White began experimenting in her yard when she and her husband moved into their first house. She “learned by mistake” until she joined Hillside Garden Club and was encouraged by more experienced gardeners. As a young mother she and her business partner, Mina Wood, plunged into landscaping every schoolyard in Lynchburg, designing nature trails and vegetable gardens, and doing freelance private garden design. In the early 1980s, White began the rehabilitation of Lynchburg’s Old City Cemetery. Established in 1806 and listed on the National Register of Historic Places, the cemetery had long been neglected and forgotten. White was first charged with restoring the Confederate soldiers’ section, but the work gradually grew to encompass the entire cemetery. Over twenty-seven years, she and her fellow volunteers raised more than $1.5 million “to build, restore, relocate, and rehabilitate the place.” To White, it “seemed there was a new project every one or two years, whether it was restoring an ancient brick wall, bringing in dismantled, 100-year-old buildings and rebuilding them, erecting a new one using salvaged antique materials, or interpreting the site.” Old City Cemetery now displays more than 250 antique roses, an old-fashioned shrub garden, a butterfly garden, a lotus pond, and many beautiful mature trees, all botanically labeled. Visitors can take guided tours on a variety of topics—historical, horticultural, and architectural. White chronicled her experiences in the book Once Upon a Time…A Cemetery Story, a treasure for future garden historians. Just a half mile from the cemetery are the house and garden of Harlem Renaissance poet Anne Spencer (see “Ardent Things” by poet Jeanne Larsen M.A. ’72). White described her first visit there as “a life-changing moment,” one that moved her to lead the restoration of Spencer’s garden. Now listed on the National Register of Historic Places, the garden has received international attention and twice won the Garden Club of Virginia Commonwealth Award—in 1985 and in 2009. White poured the experiences from this second major restoration project into a second book, Lessons Learned from a Poet’s Garden. Proceeds from the sale of the book (which can be purchased on GCV’s site: gcvirginia.org) go toward supporting the Hillside Garden Club’s work on the Spencer garden. The lessons these alumnae found in the garden—patience, the willingness to experiment and learn from mistakes, the balance between hard work and sitting back to enjoy the fruits of their labors—helped them flourish as leaders, too. And they benefited from the sunshine and light of one another’s company and support, learning that the Hollins network often bears fruit in unexpected ways. Kim Nash tells the story of attending a meeting of Mill Mountain Garden Club in Roanoke as the new GCV president. After she spoke to the club she sat down to chat with Kae Nelson Bolling ’69. She explained a sticky problem she was having: how could GCV ensure that flower show attendance stayed consistent and that the competitions were fair? Occasionally clubs struggled with travel difficulties and problems resulting from the differences in growing seasons across the state. For example, rose gardens in Richmond may be flourishing long after the roses are gone in Southwest Virginia. Turns out the Hollins network can take care of more than flat tires. Libba Wolfe, a Roanoke resident (and member of the Mill Mountain Garden Club, a GCV club), writes about gardens and books. Thanks go to Julie Gamble Grover ’75, who came up with the idea for this article. Grover is a member of the Blue Ridge Garden Club in Lexington and organized the 2012 Historic Garden Tour there. For more information about GCV’s Historic Garden Week Tour and the garden restoration projects it supports, go to gcvirginia.org. The Re-greening of the Garden: The restoration of Hollins’ Beale Memorial Garden grew from a partnership between the university and the Garden Club of Virginia. Restoring Langdon Farm: Board of Trustees Chair Susanne Smith Whitmore ’60 and her husband, John, restore seventeenth century gardens at Langdon Farm.